The Hue LightStrip kit costs a cool $90 and comes with two meters worth of light strips. You can add on one-meter extensions for $30 each. To get five meters worth of Hue LightStrips, you’d have to spend $170. However, if you’re willing to do just a bit of assembly yourself (no fancy skills required), you can get the same length of Hue-compatible LED light strips for just a little over $40. The only downsides are that your light strip won’t work with HomeKit or Hue Sync, and transitions aren’t as smooth as the real thing, but if you’re still interested in saving a lot of cash, then keep reading. To create your Hue-compatible LED light strips, you’ll need three main components: the LED light strips, the controller module, and a power supply. Unfortunately, you can only find the right controller module on Aliexpress, so be prepared to wait a few weeks, since it ships from China. Gledopto ZigBee RGB+CCT LED Controller: This controller lets you change the colors, as well as the color temperature of the white spectrum. Five Meter LED Light Strip: You can cut these down to a shorter length if need be, or you can buy more if you want something even longer (by using connectors). 12V 3A Power Supply: Three amps will get the job done for five meters of light strips or fewer. If you’re adding more, you’ll want to go with a 5A power supply. In total, this all cost me just $43.90. This same kind of setup using the official Hue LightStrips would cost $170, and that’s not including sales tax. 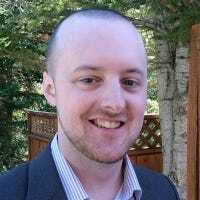 There’s not a whole lot you need to do to get it all up and running, and it takes about five minutes to put together everything. To start, take the six wires on the end of the LED light strip and plug them into their respective slots on the controller module. To do this, use a pen or small screwdriver to press down on the terminal, slide the wire into its slot, and release the terminal to lock the wire in place. Here’s a photo of what the connections look like so that you can match it with yours. Take note that the white wire doesn’t actually plug into the “W” slot, but rather the “V+” slot. Also, there are two red wires—the one next to the blue wire plugs into the “R” slot. The other red wire plugs into the “W” slot. Once you’ve made all the connections, plug the power supply into the controller module. Plug the other end into an outlet. The LED light strip should light up right away. If not, make sure that the green light on the controller is lit up. If the indicator light is on, then check the wire connections. Also, make sure to cut down the other end of the light strip so that the tips of the wires don’t touch each other. If they are touching, it won’t short out the lights, but it will result in displaying different colors than what you chose. 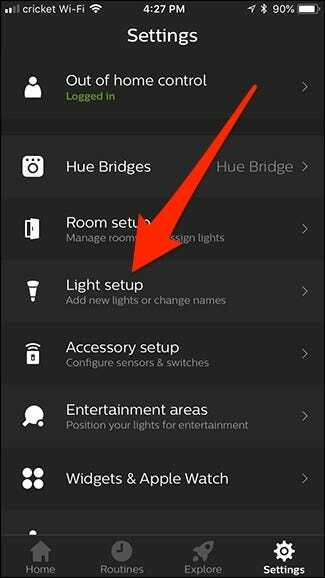 Once your light strip is working correctly, it’s now time to connect it to your Hue Bridge and control it from your phone! 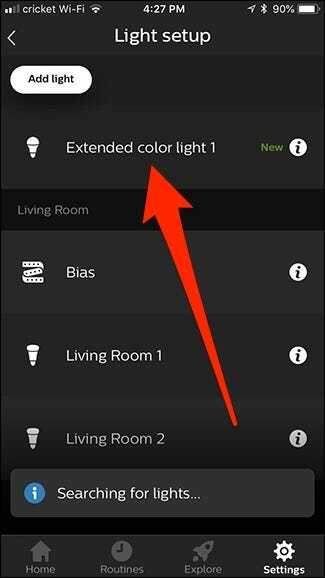 Connecting the light strip to your Hue Bridge and controlling it from your phone is the same as adding any other Hue light. 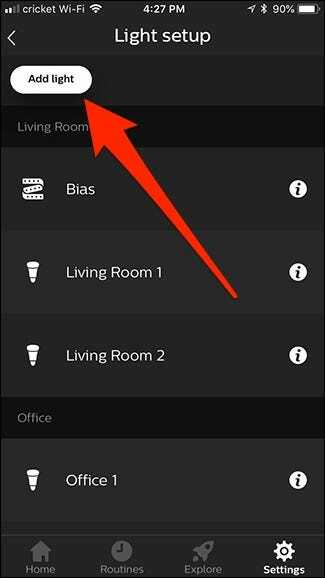 Start by opening up the Hue app and tapping the “Settings” tab at the bottom. Select “Light Setup” from the list of options. Tap “Add Light” in the top-left corner of the screen. Hit “Search” at the bottom. From there, go back and add the new light to a room under the “Room Setup” option. 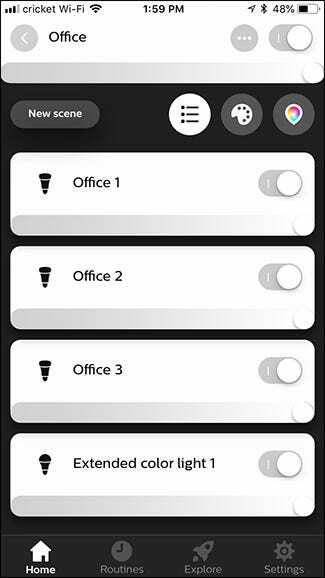 This lets you control the light and include it with your other Hue lights in that room. 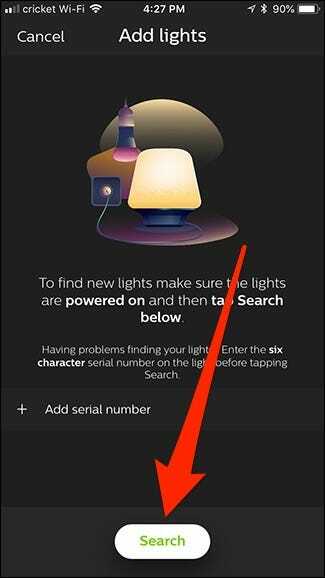 At this point, your DIY light strip acts like any other Hue light, and you would never know the difference otherwise from within the app. 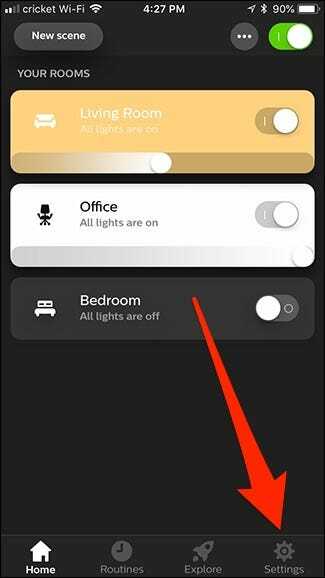 Again, the downside is that it won’t work with HomeKit or Hue Sync, and transitions are rather sudden when dimming or turning lights on and off, at least compared to the smooth transitions of an official Hue light. 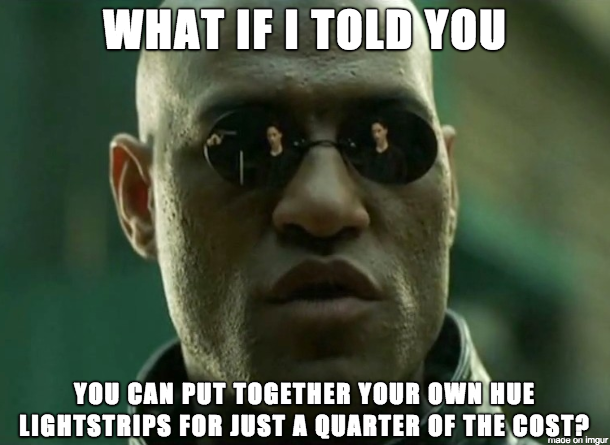 It’s not a huge deal, though, especially when you’re saving a ton of money.